The Serpent is a constellation that has fallen to Tamriel as a Celestial and now seeks to corrupt the other constellations and remake Nirn. He has taken over the minds of two of the Guardian Celestials, The Mage and The Warrior, with only The Thief escaping his grasp. He commands the Scaled Court, a group of fanatics operating in Craglorn that worship him. "You have purged my venom from the Apex Stone. Clever. Too clever for a mortal. She helped you, didn't she? I can smell her fear upon you. No matter. I will find her and consume her in time, just as I have her fellow guardians. Do not think you have succeeded here. The damage remains. The Warrior has fallen from the sky and is trapped in mortal form. He is mine." The Mage: "You won't win, Malazar. I am too strong for you!" The Serpent: "You underestimate me, Valla. I have more tricks at my disposal than you could ever imagine. I have drawn you out of your Apex Stone and made you vulnerable. I know the power you wield. I am not fool enough to try to swallow you whole. But a piece at a time …." The Mage: "I will not let you do this. I will stop you!" The Serpent: "Protest as you will, but I have already won." "Let go. Give in to the darkness. Stand, and I will simply strike you down." "Your townships embalm the world like a foul crust." "When the land was young, it fed on you. Those primordial days will return. And I will end your civilization." "You stifle growth, natural progress. I will see Nirn freed." "No! How dare you undo the work of my brood? Kill them!" "Nirn will begin anew when I escape this prison, escape Craglorn." "Under my guidance, the jungles will reclaim your shining cities." "I will drive Men and Mer from Nirn." "You won't stop what's coming! No one will!" "You escaped with your lives against the Mantikora. Why persist?" "Your end is imminent. The Stonebreaker will show you." "I see troll blood has thinned in the modern era. You will die for this! I promise you!" "I will not be contained! Do you understand me? Not by the Celestial Guardians. Not by you." "Burn them, Ozara! Burn them to ash!" "I tire of this. You will never leave the inner sanctum alive!" "You have come far - only to die on my sword." 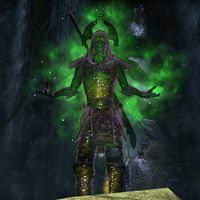 Note that the Celestials' dialog at the end of the Trial differs slightly depending on which other Craglorn Trials (Hel Ra Citadel and Aetherian Archive) the character has already completed. The Warrior does not appear unless Hel Ra Citadel has been completed, and The Mage does not appear without first completing Aetherian Archive. The Serpent: "No! The mortals must perish!" The Thief: "Serpent! I've ensured you will never return to this plane. When the Mage and the Warrior are freed from your influence, you will answer for their entrapment." The Mage: "The Serpent could not break this new seal with the blood of a thousand mortals. He will never return to this plane." The Thief: "The Warrior remains in his thrall. Even alone, that one will cause untold peril if left unchecked." The Warrior: "It is done." The Thief: "Even the two of us could not break this new seal on the Stone. The Serpent will never enter this plane, again. Let us depart—the Mage remains in the Serpent's thrall." The Thief: "But his attention will wander elsewhere. We should depart." "You will die with your people!" "By choking air and purging fire—your kind will end." "I will not be contained!" "Your death was pointless. You should have run. The mortals of Nirn will follow you, shortly." "Your friends are receiving a taste of Nirn's future." "No one will hear from you again." "I will hunt mortals until none are left." "My trolls will strip your bones of flesh, but my shamans will take so much more from you." "The rest of Nirn will die screaming. Just like you." "All will perish when I awaken the primeval fire under this land." "Nirn of old was nearly uninhabitable by the likes of you. I will see that it returns to that state." "I forced the Thief into hiding. I riled the Warrior to frenzy. I shattered the Mage into so many pieces she cannot remember which one is real. What chance have you against me?" "I am the stars and the sky, and everything that lies beyond. There was no hope for you." "In my wake, the seas will boil, and the roots of the earth will rise to tear civilization apart." "The shining cities of Man and Mer will become their graves―when I tear them to the ground." "As you die, so will the countries of Man and Mer." During their confrontation, The Mage refers to The Serpent as "Malazar". 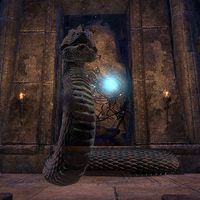 Given that the Celestials may have once been mortals that ascended to becoming manifestations of the constellations, Malazar may have been the Serpent's original mortal form. This page was last modified on 18 December 2018, at 22:31.